Increasing construction activities, establishment of business hubs & industries and infrastructure development have resulted in the development of power infrastructure, which have amplified the demand for transformers across all Middle Eastern region. Further, global events such as Dubai World Expo 2020, Qatar FIFA World Cup 2022, National Development Plans and economic diversification, expansion of power infrastructure would also surge the transformer market over the next six years. 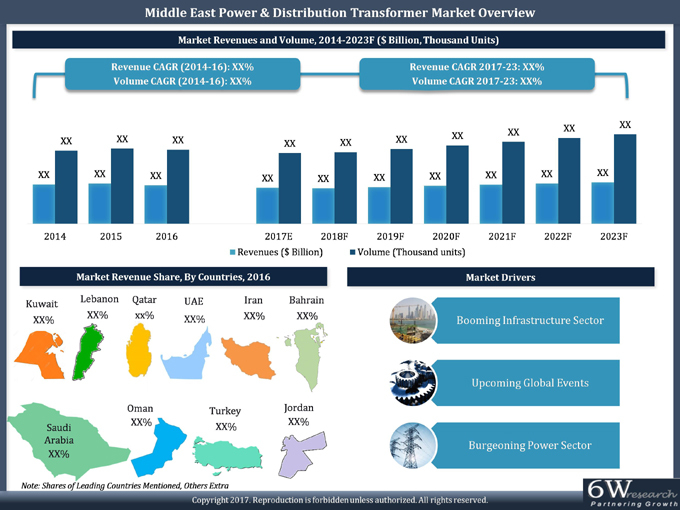 According to 6Wresearch, Middle East Power & Distribution Transformer Market is projected to reach $1.6 billion by 2023. UAE, Saudi Arabia and Kuwait government are taking major steps to strengthen the non-oil sectors due to recent decline in crude oil prices, which have adversely affected the market during the last 3 years. With expected recovery of crude oil prices and increase in public infrastructure development for next 5 years, the market would rebound during the forecast period. Distribution transformers captured leading volume share in the overall market pie and is also expected to register growth during the forecast period due to growing power demand in residential and construction sectors. Upcoming mega projects such as Lusail city, railway network expansion and economic cities would also drive the Power & Distribution Transformer Market. Key players in the Middle East Power & Distribution Transformer Market include ABB, GE, Hyundai, Siemens, Emirates Transformers & Switchgears, Saudi Transformers Company. The report thoroughly covers the Power & Distribution Transformer Market by types, power rating, cooling system, applications and countries. The report provides an unbiased and detailed analysis of the on-going trends, opportunities/high growth areas, market drivers which would help the stakeholders to device and align their market strategies according to the current and future market dynamics. • Historical Data of Global Power & Distribution Transformer Market Revenues and Volume for the Period 2014-16. • Market Size & Forecast of Global Power & Distribution Transformer Market Revenues and Volume until 2023. • Historical Data of Middle East Power & Distribution Transformer Market Revenues and Volume for the Period 2014-16. • Market Size & Forecast of Middle East Power & Distribution Transformer Market Revenues and Volume until 2023. • Historical Data of Saudi Arabia Power & Distribution Transformer Market Revenues and Volume for the Period 2014-16. • Market Size & Forecast of Saudi Arabia Power & Distribution Transformer Market Revenues and Volume until 2023. • Historical Data of UAE Power & Distribution Transformer Market Revenues and Volume for the Period 2014-16. • Market Size & Forecast of UAE Power & Distribution Transformer Market Revenues and Volume until 2023. • Historical Data of Qatar Power & Distribution Transformer Market Revenues and Volume for the Period 2014-16. • Market Size & Forecast of Qatar Power & Distribution Transformer Market Revenues and Volume until 2023. • Historical Data of Turkey Power & Distribution Transformer Market Revenues and Volume for the Period 2014-16. • Market Size & Forecast of Turkey Power & Distribution Transformer Market Revenues and Volume until 2023. • Historical Data of Kuwait Power & Distribution Transformer Market Revenues and Volume for the Period 2014-16. • Market Size & Forecast of Kuwait Power & Distribution Transformer Market Revenues and Volume until 2023. • Historical Data of Lebanon Power & Distribution Transformer Market Revenues and Volume for the Period 2014-16. • Market Size & Forecast of Lebanon Power & Distribution Transformer Market Revenues and Volume until 2023. • Historical Data of Iran Power & Distribution Transformer Market Revenues and Volume for the Period 2014-16. • Market Size & Forecast of Iran Power & Distribution Transformer Market Revenues and Volume until 2023. • Historical Data of Oman Power & Distribution Transformer Market Revenues and Volume for the Period 2014-16. • Market Size & Forecast of Oman Power & Distribution Transformer Market Revenues and Volume until 2023. 21.5. Emirates Transformer & Switchgear Ltd.
21.9. The Saudi Transformers Company Ltd.
21.11. Hyundai Electric & Energy Systems Co., Ltd.